Scan has teamed up with Optoma to gift one of their fans with brand new projector! 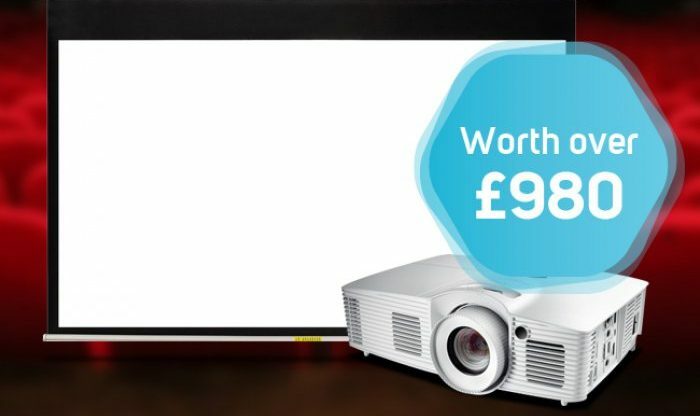 To enter in their latest Optoma HD39Darbee Projector and 92” White Screen Giveawaygrab your free entries by following few simple steps listed down below! The HD39Darbee is engineered to deliver a powerful and immersive experience for gaming, movies, and viewing photos. The integrated DarbeeVision image enhancement technology utilizes neuro-biologic algorithms to achieve unprecedented detail in skin tones, textures, and reflective surfaces while delivering superior depth, object separation and automatic removal of unsightly artifacts. The end result is an immersive, larger-than-life experience with Xbox One and PS4 games, Blu-ray movies, HDTV programming, and home videos and photos. With 3,500 lumens and an amazing 32,000:1 contrast ratio, the HD39Darbee delivers bright images with deep black levels, and its Reference Display Mode enables accurate, vibrant colors in all media content. With 15,000 hours of lamp life, the HD39Darbee requires very little maintenance, for hours of gaming and viewing entertainment. Not known how winner is going to be contacted, probably by email and announced in giveaway widget.